Minipan’s Comby3 is a line of automatic forming machines for cookies, which can also extrude, deposit and wire-cut. 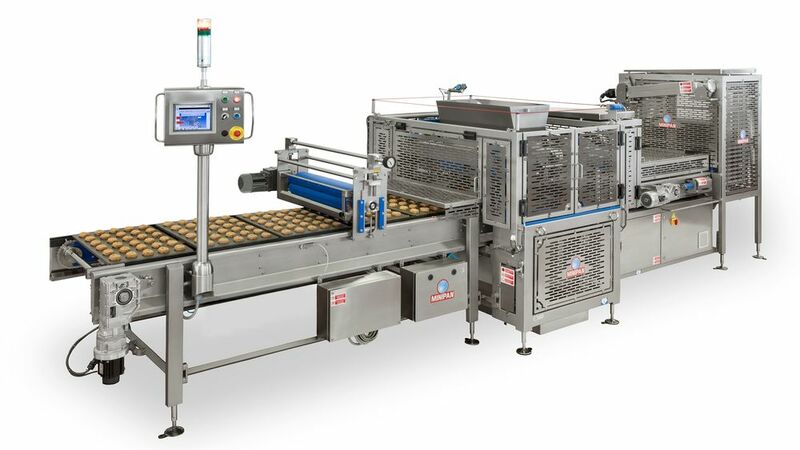 They can process a variety of doughs thanks to the increased strength and sensitivity of the depositing head equipped with three stainless steel rollers. Easy maintenance mechanics match with the newest generation of computerized controls to supply endless possibilities of movements; furthermore it can store over forty recipes in its internal memory. Versatility, ease of operation, high production rates, excellent product quality provide considerable savings on time and labor costs. The picture shows the model CombyPlus with movable and extractable head, an industrial depositor suitable for direct delivery on tunnel ovens or tray conveying systems. Comby3 800 maintains the traditional characteristics of depositor, wire-cutter, extruder and features the most advanced technologies: head movement controlled by brushless motors.